Last 10K is an in-depth catalog detailing every aspect of a company’s financial statements, such as earnings and revenue as well as cash flow trends and debt load to name a few. Each display shows tables that represent raw financial values that have been optimized for mobile interface, making them viewable as well as easy to read and share. Last 10K helps individuals gather financial information and form an intelligent analysis on a company’s financial status. With the Last 10K app, people can look up on a company’s cash flows, balance sheets, fair value measurements, accounting policies, legal proceedings, schedules, statements, and more. Other complex financial information such as stock market health, book value, trading price, market cap, volume, price ratios, and EBITDA are also viewable. Look and gather information on statements, schedules and disclosures including Balance Sheets, Cash Flows, Accounting Policies, Fair Value Measurements, Legal Proceedings and much more. Monitor stock market data including trade price, volume, book value, market cap, EBITDA, price ratios and more. Download a company’s entire financial statement in Excel. Share a specific section of a financial statement using e-mail or PDF. Find a company by name or ticker with search suggestions. 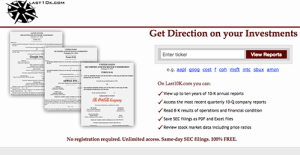 Covers all US-based publicly traded companies including OTC and ADRs. Last 10K offers free unlimited anonymous access to complete financial data for companies that file with the Securities and Exchange Commission (SEC). This information is useful to investors, researchers, potential employees or anyone interested in the workings of a public company. It includes annual filings for the past 10 years and quarterly filings for the past 1 year. Last 10K’s unique features include the press release linked to the filing. In addition, it offers free downloads of the filing in convenient formats including PDF and Microsoft Word, and data in Microsoft Excel. You can also easily share by linking the filing data to Evernote. For mobile users, it offers apps for Apple, Android, and Windows devices for quick mobile access to financial data. What Problems Will Last 10K Solve? You are walking into a meeting with a new corporate client but know little about them. What important data would you like at your fingertips? With Last 10K website or apps, you can instantly see exactly how profitable the client has been in the last quarter. You can also review the biggest threats they perceive to their business under the discussion of Risk Factors in the most recent annual report. With this knowledge, you are able to objectively assess your client’s needs and address their biggest financial fears without them saying a word. You are considering taking a job that involves a significant change in your life including a move to a new city. How financially stable is your prospective employer? With a few clicks, you can instantly see the balance sheet of the company. Now you know how much short and long term debt is owed by your new employer. You can gauge the ability of this company to take on a new employee and keep its commitments to its current employees. You work for a company that operates under threats of lawsuits and is not open with employees about current and former lawsuits. Instantly, you can find out through the Last 10K website or app the most recent management discussion of legal issues that have the potential to affect the performance of the company. There are trendy and widely used systems in each software category. But are they automatically the best fit for your company’s specific wants? A popular software product may have thousands of customers, but does it offer what you need? For this reason, do not blindly shell out for popular systems. Read at least a few Last 10K reviews and think about the aspects that you desire in the software such as the cost, main tools, available integrations etc. Then, select a few apps that fit your wants. Check out the free trials of these apps, read online reviews, get clarifications from the maker, and do your research thoroughly. This exhaustive research is certain to aid you select the best software solution for your organization’s special needs. How Much Does Last 10K Cost? Last 10K is a free financial tool. We realize that when you make a decision to buy Accounting Software it’s important not only to see how experts evaluate it in their reviews, but also to find out if the real people and companies that buy it are actually satisfied with the product. That’s why we’ve created our behavior-based Customer Satisfaction Algorithm™ that gathers customer reviews, comments and Last 10K reviews across a wide range of social media sites. The data is then presented in an easy to digest form showing how many people had positive and negative experience with Last 10K. With that information at hand you should be equipped to make an informed buying decision that you won’t regret. What are Last 10K pricing details? What integrations are available for Last 10K? Last 10K provides integrated PDF downloads, Microsoft Word downloads, and Microsoft Excel downloads. It links to analytic resources provided by Ask9W. If you need more information about Last 10K or you simply have a question let us know what you need and we’ll forward your request directly to the vendor.